The Import Videos/Images as Clips dialog allows you to import still images or movie files into video tracks in your projects. Video tracks are independent from your animatic. They can be put above the storyboard track to display video and image clips over the elements in the storyboard, or underneath the storyboard track to display its clips behind the storyboard. Allows you to browse for and select the image or movie files to import as clips. Determines in which video track the clips are added. Adds the imported video clips onto their own new video tracks. Adds the imported video clips to the currently selected video track. NOTE This option is unavailable if no video track is selected. If you are importing image clips, this determines the amount of frames each image clip will span over. Since image clips are just still images being displayed for a set amount of time, you must decide their duration in the animatic. If you are importing movie files, the duration of the video clip will be the duration of the original movie file and this field will be ignored. The value of this option is in frames. For example, if you want the image clip to last for 1 second, and the frame rate of your project is 24 frames per second, set this option to 24. 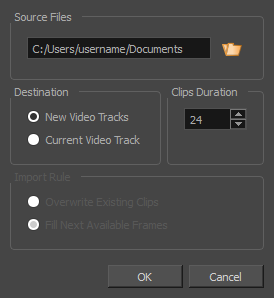 When importing in an existing video track, this decides what happens if the clips are imported where videos clips are already present. NOTE These options are unavailable if no video track is selected. If there are existing video clips where the imported clips are supposed to be added, the existing clips will be overwritten. If there are existing video clips where the new clips are supposed to be added, the clips will be trimmed just before the existing clips.